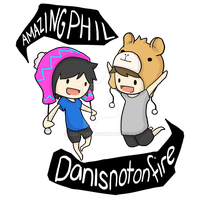 Dan is most certainly my favourite You Tuber, well and Phil. If they get back to me, and aren't interested, then I'll take the watermark off, you can download the full version and use it (responsibly) as a wallpaper, or whatever. Even send it to Dan and show him my work! You should email it to them again since they have new merch out now and are using other people's work in their items! i love this! I'm thinking of making a video with a bunch of fan art. this is an amazing piece, would You mind if I used it? This is so great! I love the pose, makes him seem all the more awkward. Love the shirt too! This is hilarious! Well done, Chibi! ALL HAIL THE LEADER OF THE LLAMARMY! this is DANSHING! Get it? like dashing, but danshing... i should shut up now. this is awesome! may I ask what program you used to make this? c: the background reminds me of Phil's channel's new background! wow, i can imagine dan saying something like that.....and this is really good, going in my faves! The most awesome thing I've seen all year!!!! I love Dan and his social awkwardness! I can IMAGINE him saying this XD He's so awesome. "Socially awkward, at your service." Haha, I love it! I like when things I enjoy on other sites pop up on this site. Hoorah for the Dan, he is totally not on fire and therefore this picture is pretty perfect. I love dan !! Omg I love you for making this!! I was planing to draw something of him but shoot never mind XD You rock! YOU'RE AN ACTUAL LEGEND FOR THIS OKAY. I really hope he uses it You are really talented! This is so cute, I love it! I'd love to see more work from you!